I’ve really begun to enjoy cooking with tofu. I use extra firm tofu to cook with or silken tofu in place of yoghurt in smoothies. I’ve been on the lookout for good tofu recipes and have found three that I am anxious to try. I’ll probably make one or two of them this weekend. Stay tuned to see my reports of how they tasted and pics of how it looked. Serve these “steaks” with soy sauce and a green-onion garnish. Be sure to use firm tofu. Brown it gently so that it loses some moisture before coating it with bread crumbs and sesame seeds, then browning again. Divide the green onions among individual plates. Top each serving with 3 tofu steaks and serve immediately. Serves 4. This vibrant dish is enlivened by sweet bursts of mango. To make basil chiffonade, stack several leaves, roll them up lengthwise into a bundle and slice thinly across. In a saucepan, heat 1 tablespoon of the olive oil over medium heat. Add the shallots, ginger and garlic and saute until fragrant, about 3 minutes. Add the tomato, curry powder and coriander and simmer until the tomato begins to soften, about 1 minute. Add the stock, coconut milk and lemon grass. Raise the heat to high and bring to a boil, then reduce the heat to medium-low and simmer for 3 minutes to allow the flavors to blend. Remove from the heat. In a nonstick sauté pan, heat the remaining 1 tablespoon olive oil over medium-high heat. Add the tofu, sprinkle with the turmeric and cook for until tofu is thoroughly browned. Transfer to a bowl and keep warm. Add the wine and deglaze the pan, stirring with a wooden spoon to scrape up any browned bits. Add the curry sauce to the pan, raise the heat to high and bring to boil. Reduce the heat to medium, add the edamame and cook until the edamame are tender-crisp, about 3 minutes. 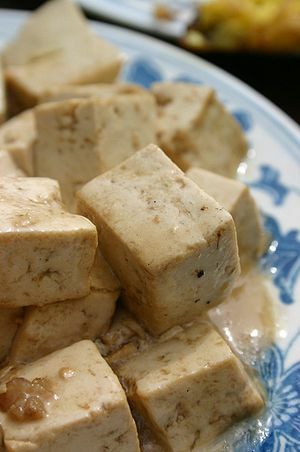 Return the tofu to the pan and cook for 1 minute. Remove from the heat. Add the mango and salt and stir to combine. Discard the lemon grass. Divide the curry among warmed individual plates and garnish with the basil. Serves 4. This was originally a recipe that called for chicken. I have substituted tofu for it. Because of the changes I’ve made, I do not have accurate nutritional information for this recipe. Wrap the tofu in paper towels and place on a plate. Put another plate on top of the tofu and place some heavy soup cans on the top plate to press liquid out of the tofu. Leave for 15 minutes. While the tofu is being pressed, head oven to 350 degrees. Unwrap the tofu and cut it into strips. Place on a baking sheet and bake for 15 minutes to remove any more water. Season the tofu with salt and pepper. Heat the olive oil in a nonstick wok or large nonstick skillet over high heat. When the oil is hot, add the tofu and cook, tossing with a wooden spoon, until it begins to brown. Turn off the heat and transfer the tofu to a plate. Blanch the broccoli in the boiling water until the stems just begin to get tender, about 1 or 2 minutes. Drain and set aside. Add the sesame oil and garlic cloves to the wok. Turn the heat to medium and cook until the garlic is fragrant and lightly golden. Remove the garlic, add the ginger and cook for another minute. Turn the heat to high, add the carrots and cook, tossing with a wooden spoon, for 2 minutes. Add the peas, red peppers and hot pepper flakes, continue tossing with the spoon and cook for 1 minute more. Add the tofu, broccoli, vinegar and soy sauce and cook for 2 minutes more. Serve immediately over a bed of brown rice. Serves 4.